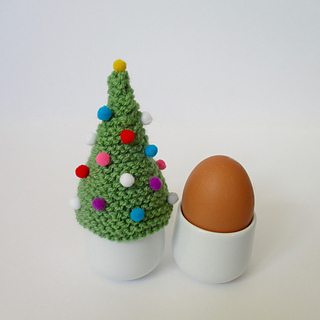 The egg cosy is approximately 9.5cm tall and 8cm wide (un-stretched). 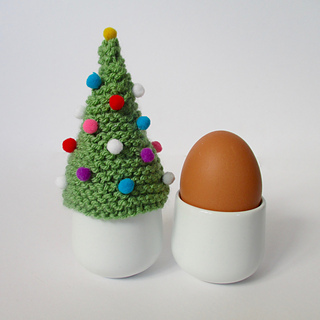 Have a festive breakfast and keep your boiled eggs warm with this little Christmas Tree egg cosy. This is a great project for beginner knitters to try as you just need to know two stitches (knit and a k2tog decrease), and the cosy is knitted flat on straight needles (not in the round). My tree is decorated with little ready-made pompoms, but you could also sew on buttons, beads or sequins instead. TECHNIQUES: All pieces are knitted flat (back and forth) on a pair of straight knitting needles. You will need to cast on, knit, work a k2tog decrease, and sew a seam.